Seven Years' War (1756-1763) - The Seven Years' War is generally considered the first true world war in history, in that it stretched across much of the globe. It was fought in Europe, North and Central America, off the coast of West Africa and in India, as well as the Philippines. In North America it is usually referred to as the French and Indian War (however, in French speaking Quebec, it is known as the War of Conquest). 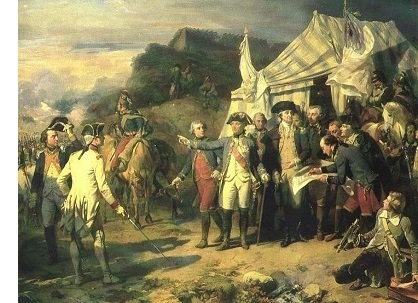 Despite the name Seven Years' War and being officially dated between 1756 and 1763, conflict actually first broke out in 1754 between Great Britain and France. They were the two superpowers of the world at the time and controlled the most territory in North America. But there were no clearly defined borders between their colonies, which was an invitation for conflict. In the early 1750s the French began building a series of forts along their eastern frontier in an attempt to check westward British colonial expansion. The most significant of these was Fort Duquesne located on the confluence of the Allegheny and Monongahela Rivers (present-day Pittsburgh). This was in the heart of the Ohio Valley which was highly sought after by both countries, particularly British colonists, for its potential farmland. While the British government tried to resolve the dispute peacefully, some of its colonists decided to take matters into their own hands. The governor of Virginia Colony sent a militia led by lieutenant Colonel George Washington into the territory to lay claim to it. They came across a small French force and fighting broke out. It is considered the opening shots of the war. News of the skirmish reached Europe, but instead of trying to de-escalate the situation, the two countries scrambled to reinforce their positions. Both sent regular troops across the Atlantic and the first major battle took place at Fort Beauséjour on June 16, 1755 (in present-day New Brunswick). The British captured the fort and expelled the French colonists living there (known as Acadians). But the following month, an expedition of 2,000 troops led by General Edward Braddock was beaten badly at the Battle of Monongahela (Braddock eventually died from wounds he received in the conflict) when they tried to take Fort Duquesne in the Ohio Valley. The French were aided by native American warriors who saw British colonial expansion as the greater threat. England was having greater success at sea, however, where it was capturing French merchant vessels and imprisoning their sailors. Up until this time the two nations were still considered on peaceful terms, but the escalating violence led France to declare war in the Spring of 1756 (thus the official start date of the war). 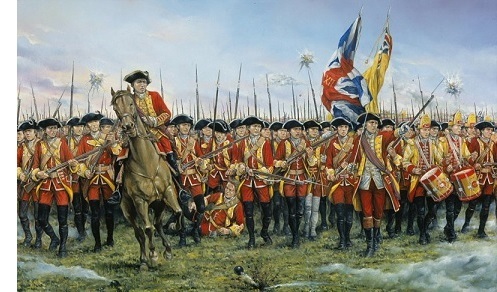 England had hoped to keep the fighting confined to North America, but France had determined that victory lie in attacking British possessions in Europe, which included the German district of Hanover (where King George II was born). 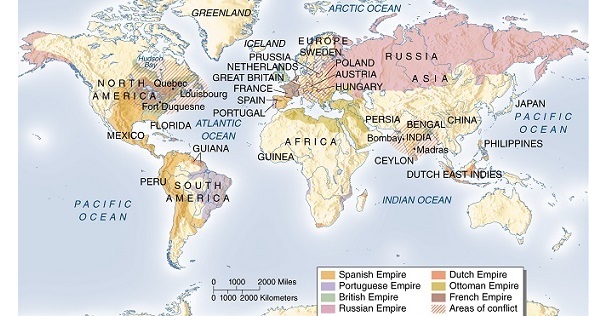 This expansion of the war would eventually pull other European powers into the conflict. England formed an alliance with Prussia in which Frederick II agreed to protect Hanover from France. To counter this, France teamed up with Austria, Prussia's foe. This represented a fundamental shift in alliances as England had previously been opposed to Prussia in the War of Austrian Succession, while Bourbon France and Habsburg Austria had been traditional enemies. The flip is known as the Diplomatic Revolution. In Central Europe, the Seven Years' War is typically called the Third Silesian War (see Frederick the Great). King Frederick initiated it. He preempted an anticipated attack on Silesia by invading Austrian ally, Saxony on August 29, 1756. Saxony's army surrendered in October. The downside for Frederick is that it created anti-Prussian sentiment across Europe for his attack on a neutral country. As Austria prepared to counter-attack, Frederick once again took the initiative and invaded the Kingdom of Bohemia. The Austrians met him at Prague and both armies engaged in a bloody battle on May 6, 1757 in which the Prussians were victorious. However, the price was so high that Austria was able to regroup and win the Battle of Kolin the following month. It was the first tactical defeat of Frederick's military career and it was costly. He had to abandon plans to march on Vienna and was forced to withdraw from Bohemia altogether. In the meantime, Russia had become alarmed by Prussia's growing military strength and invaded its eastern border with 75,000 soldiers. Although it managed to defeat a much smaller Prussian force at the Battle of Gross-Jägersdorf in August 1757, it failed to take Könisberg and pulled back soon after. But these losses encouraged still other countries to join the fun. Sweden invaded Prussia towards the end of 1757 with a small army of 17,000. This portion of the Seven Years' War is referred to as the Pomeranian War and was fought largely to a stalemate. Still, Frederick now faced the prospect of four powerful enemies attacking from all sides (Austria from the south, Russia from the east, Sweden from the north and France from the west). Prussia could very easily have been destroyed. But just when things looked their bleakest, Frederick managed to win a couple of stunning victories. On November 5, 1757, he beat back the French at the Battle of Rossbach. The following month, he crushed a numerically superior Austrian army at the Battle of Leuthen. Outside of Europe, the most important battle of the war in 1757 was the Battle of Plassey in India. The British East India Company defeated the French East India Company and her Mughal ally which gave Great Britain virtual control over trade in the subcontinent and greatly increased England's ability to fund the war. In North America, 1758 was a pivotal year. Until then, the French had largely been beating the English in most of the engagements. But in that year, British forces captured Fort Louisbourg (on present-day Nova Scotia). This was a key strategic victory because Louisbourg was the guardian of the mouth of St. Lawrence River; and with it now in British hands, they could sail up the river and assault Quebec by sea. Concerned about this reversal of fortune, King Louis XV appointed Duc de Choiseul France's new Foreign Minister. Choiseul sought to end the war in 1759 by developing a grand plan to invade the British Isles. However, such a plan would require naval superiority on France's part, and any hopes of that were dashed with two crushing defeats at sea; the Battle of Lagos in August, and Quiberon Bay on Novemeber 20, 1759. After Quiberon Bay, France was forced to abandon its plans to invade Britain. In fact, 1759 went so well for England that it has been dubbed the Annus Mirabilis (year of miracles). Besides the aforementioned naval victories, Great Britain captured Fort Ticonderoga (in present-day New York), expelled the French from the Ohio Valley and conquered Quebec. This virtually ended France's designs on colonizing North America. In addition, England took the French island of Guadeloupe in the Caribbean, repelled an attack on Madras in India and helped win the Battle of Minden on mainland Europe. With France's colonial losses, fighting largely ended in North America by 1760. But it continued on for several more years in Europe and saw the addition of two more countries in 1762; Spain on France's side and Portugal on Great Britain's. Also in 1760, King George II of England died, and his grandson, George III succeeded him. He cut off all military and financial aid to Prussia, which left Frederick in a tight spot. He was still surrounded on all sides by enemies and his army had been reduced to 60,000 men. Prussia was in danger of being wiped off the map. Then in January, 1762 another royal death reversed his fortune yet again. Empress Elizabeth of Russia died and Peter III became the new Tsar. Although he was Peter the Great's grandson, he was born in Schleswig-Holstein, and was German in almost every sense of the word. More importantly, he was a great admirer of Frederick II. So one of his first acts as Tsar was to make peace with Prussia. Even better for Frederick, he mediated a peace between Sweden and Prussia as well. And with France on the ropes against Great Britain, that left only Austria as Prussia's sole opponent. In July 1762, Prussia won the Battle of Burkersdorf, followed by the Battle of Freiberg in October, and Austria was ready to make peace. That led to the Treaty of Hubertusburg in February 1763. This remarkable turn of events in Prussia's favor is now known as the "Miracle of the House of Brandenburg". The Treaty of Paris ended hostilities between France and Great Britain, and saw England's rise as the supreme power in the world.